The Isle of Arran distillery is set to release the last of its three Smugglers’ Series single malts tomorrow morning (12 July). The Exciseman, a no age statement (NAS) single malt, follows The Illicit Stills and The High Seas in the series, all presented in packaging that resembles a hardback book with a cut-out compartment hiding the bottle. The trilogy aims to honour ‘the exuberant character of those striving to outwit the Government’s representatives in the pursuit of the production of the famed “Arran Waters”’. The Exciseman uses whisky matured in ex-Madeira casks – similar, the distillery said, to those used by Arran’s illicit distillers. Quarter casks are also employed as these smaller casks would have been easier to transport by the smugglers. 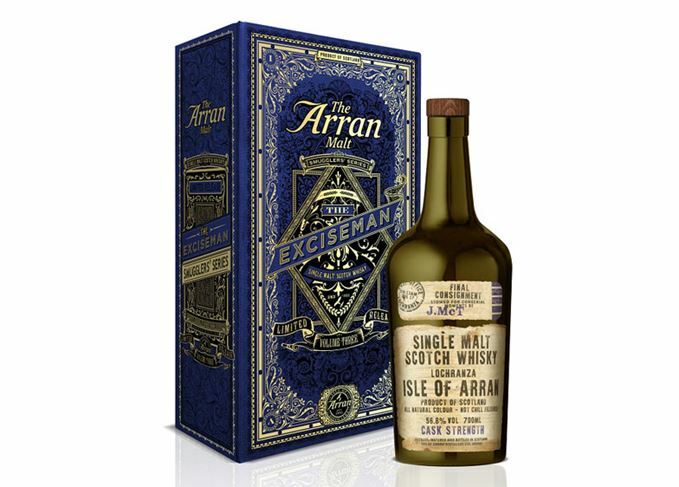 Isle of Arran Smugglers’ Series Vol 3 ‘The Exciseman’ is bottled at its natural cask strength of 56.8% abv, non-chill filtered and without artificial colouring. Priced in the UK at £89.99 each, 8,700 bottles will be released worldwide, and will be available online from 11am on Wednesday, 12 July from arranwhisky.com and specialist retailers.